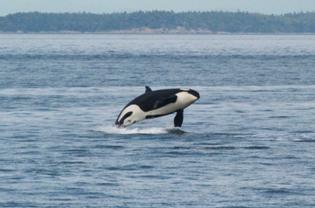 Why orca and not tigers or dinosaurs or bottlenose dolphins or bears? A question that I am often asked and a question that, if I am perfectly honest, I find difficult to answer. I don't really know "why orca". For me, it has just always been that way, from as far back as I can remember, when I first laid eyes on one. I had always loved all animals as a child but growing up in a big concrete town, I never had the opportunity to see or learn about whales and dolphins. That is, until I saw Keiko, the orca who played Willy in the hit Hollywood movie "Free Willy". My four-year old heart melted. I remember being sat in that cinema chair in 1994 filled with absolute awe and, despite the fact I was only watching this magnificent creature through a television screen (albeit a very large TV screen), I felt a connection with him, with his entire species. There was just something special about this animal, something magical - something that even to this day I find incredibly difficult to put into words. And this wonder wasn't limited to Keiko as an individual - not at all. I still get shivers down my spine and feel that indescribable excitement building when I watch those first few moments of the "Free Willy" movie - the video footage of orca swimming through the open ocean, with the signature opening credit theme music playing over the top. This burning passion that gripped me as a toddler has stayed with me throughout my life so far and I now bare the proud label of "orcaholic", that many of you share with me. So why orca? The conclusion that I have reached is that there's just something about orca. 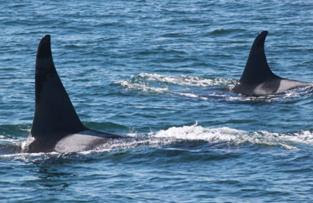 Which isn't very helpful at all, so I put the question to the girl who grew up with orca (and many other cetacean species) in her back garden, Melisa Pinnow. Once you've read why it's orca for Melisa, we would love to hear from YOU - why have orca stolen your attention, and possibly even your heart? I am asked this question all the time and I often wonder about it myself. I believe one reason I fell in love with orcas is due to their lifelong family bonds. Sons and daughters stay with their mothers their entire lives, making them relatable. It proves to me that these beings can feel emotions, experiencing happiness and excitement as a younger sibling is being born or sadness and mourning when a family member passes away or is captured for life in a tank. Their extremely high level of intelligence, problem solving abilities and hunting techniques also draws me in. I love how they all have unique saddle patches, eye patches and dorsal fin shapes that allow me to identify and get to know each individual I meet and their personalities are just as unique. Another reason is an adult male’s 6 foot tall dorsal fin. Watching something so tall rise up out of the water as a male surfaces is an amazing sight. I also love all of their surface behaviors they do from breaching, spy hopping, belly flopping and cartwheeling to above water vocalizations and playing with kelp. Another reason is that they are just as curious of us as we are of them. On 8/31/12 a 5 month old female named L119 came straight over to our boat and playfully tail slapped and looked up at us from underwater. She paralleled us for a bit then abruptly turned and rolled around in delight as if we were the most exciting thing she had ever seen in her life. On separate occasions we have also had Cappuccino K21, Cousteau L113, Mystery L85, Samish J14, Wave Walker L88, Star J46, Mega L41, and Mike J26 come over to our boat and eye us. I also love orcas for the sounds they make. An orca’s quick exhale and inhale is my favorite sound in the world. During summer nights I open up my window and go to sleep to the sounds of the Southern Resident orcas breathing as they swim past my house. I also love their vocalizations they make, especially the calls of resident orcas because each pod has a unique accent that makes it so you can identify a pod just by listening to them. 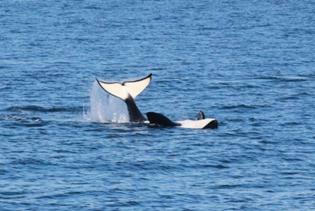 Plus, who couldn’t love an orca’s sleek black and white patterned body! These are the reasons I am interested in orcas. Melisa is also author of Orca in my Garden. So nice to have found you! Why orca for me? They are beauty, power, and intelligence with a little playfulness all in one. Three aspects that we look for in humans but rarely find.